The Japanese Flowering Cherry tree is considered to be one of the most beautiful ornamental cherry trees. It is also called prunus serrulata and has been given the name 'sakura.' The tree flowers briefly in April. However, its flowering period can be lengthened by combining early and late flowering cherry cultivars during its establishment periods. It is easy to establish and can tolerate partly shade conditions to full sun. Moreover, it can also do well in a wide variety of soil conditions. 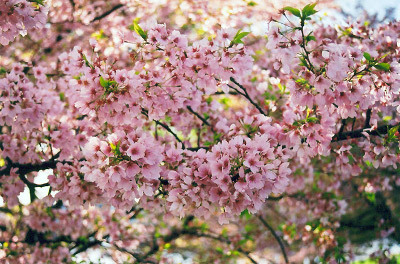 The Japanese Flowering Cherry tree is a free flowering plant. It has several blooms which produce fragrant, pink to white flowers. Its foliage has an oriental branching pattern with several dark to dark-green leaves that are glossy in nature. The plant can establish well in well-drained soils and in full sun. It is considered to be a hardy cherry tree with USDA zones of five to eight. A well-established Japanese cherry tree can grow up to a height of approximately forty to fifty feet with a spread of fifteen to twenty feet. In addition, the tree requires enough space for it to establish well. It is important to note that the Japanese cherry doesn’t do well in very dry conditions as it is not tolerant to drought. Moreover it is considered to be a shallow rooted cherry. The Japanese Flowering Cherry tree can be grown in back yards or gardens. It requires a very wide deeply dug hole which is twice as wide as the root ball. The hole needs to be filled with a composted manure soil in the ratio of one third of organic matter to two thirds soil. The tree plant is then planted with its root balls carefully scored in the soil so as to help prevent girdling. The tree requires regular replenishing of the compost around its roots. It is important to note that the cherry tree requires moist to well drained soils. For centuries, the Japanese Flowering Cherry tree has been adored for it lovely white to pink blossoms that is not only spectacular but also eye catchy. It spreads wide enough providing a great shade during the intense heat of the sun in the summer afternoons. It is considered to be the best for picnicking under its shade. It can also be used to enhance parks or yards due to its lovely blossoms.